You can almost call it a case of love at first sight for this dog and his loyal, feathered bestie of six years. Melissa Gill lives in Santa Monica, California, and works as a digital projects manager for the Getty Research Institute. Gill adopted her 8-year-old Shetland sheepdog and keeshond mix, Jackson. 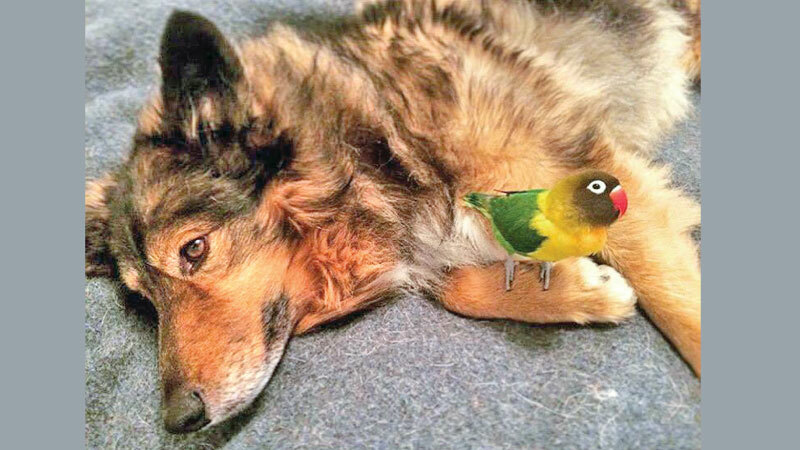 A year after she rescued her 10-year-old black masked lovebird, named Bird Noir. Yet these two friends seem as if they’ve been joined at the hip since forever. “I don’t quite remember when their friendship started,” Gill said. Bird Noir even breaks out his best mating dance moves for Jackson from time to time, showing just how much he appreciates his best friend/perpetually cozy chair. Bird Noir was originally given as a gift to a woman who didn’t have time to take care of him. Jackson came from a shelter in Battle Ground, Indiana, where Gill used to live. “Adopting is very important to my husband and I because we know there are so many animals out in the world who don’t have loving, permanent homes,” Gill said. 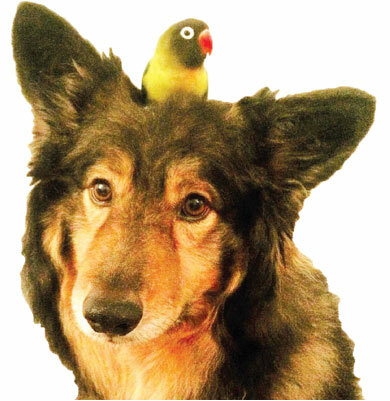 The first time Gill brought Bird Noir to the shelter to make sure the two animals would be a match, Jackson was incredibly happy to see the lovebird. Gill instantly knew that this was the start of something beautiful. After all, when Gill used to own three chickens, Jackson had no problem letting them hitch the occasional ride. Jackson and Bird Noir now remain inseparable - and their friendship works pretty well on both ends. Jackson always has company and Bird Noir can always count on Jackson to play the role of a conveniently fluffy nest and chair. You can keep up with their adventures on Instagram.